The small form factor Wireless Switch Dualband Access Point DWL-8220AP increases wireless LAN secure mobility, supports dualband WLAN connectivity, and provides client access to the functions of the AirPremier® MobileLAN™ DWS-1008 Wireless Switch. The small form factor Wireless Switch Dualband Access Point DWL-8220AP increases wireless LAN secure mobility, supports dualband WLAN connectivity, and provides client access to the functions of the AirPremier® MobileLAN™ DWS-1008 Wireless Switch. Each DWL-8220AP continually tunes itself for optimal RF channel and transmit power to provide all mobile clients with the best wireless signal in both the 802.11a and 802.11g bands. Individual DWL-8220APs have no local storing of any data so they can be safely installed in unsecured areas without fear of hacking or theft. The DWS-1008 Wireless Switch is the hardware that stores vital network and user information and is typically stored in a secure location. DWL-8220APs can link to DWS-1008s directly or through the existing wired network - even across Layer 3 boundaries - and receive Power over Ethernet (PoE) from directly connected DWS-1008s or third-party PoE injectors. The DWS-1008 Wireless Switch automatically configures every connected DWL-8220AP so that no configuration is necessary during installation. If a DWL-8220AP needs to be replaced, the replacement DWL-8220AP automatically inherits the same configuration, making the replacement process analogous to changing a light bulb. 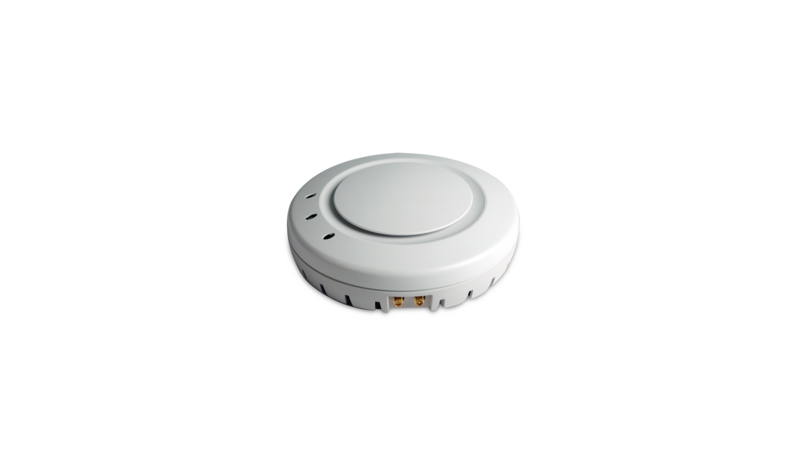 These plenum-rated DWL-8220APs intentionally resemble smoke detectors to minimize visibility. With no protruding antennas and no obvious hallmarks of an AP, DWL-8220APs are less likely to be tampered with. For added protection, all APs feature a built-in security lock interface. DWL-8220APs play a key role in rogue detection – they continuously scan both bands and their associated channels to root out rogues while simultaneously providing wireless connectivity to mobile clients. If a rogue is detected, the closest DWL-8220AP can launch RF Countermeasures by spoofing 802.11 control messages. This prevents clients from communicating, associating and authenticating with a rogue. For important wireless transmissions such as VoIP related applications, DWL-8220APs also deliver critical user-based services, such as prioritized delivery of voice traffic. Supporting multiple queues per user, DWL-8220APs always prioritize expedited traffic such as voice calls, and then service three other levels of traffic in priority order.